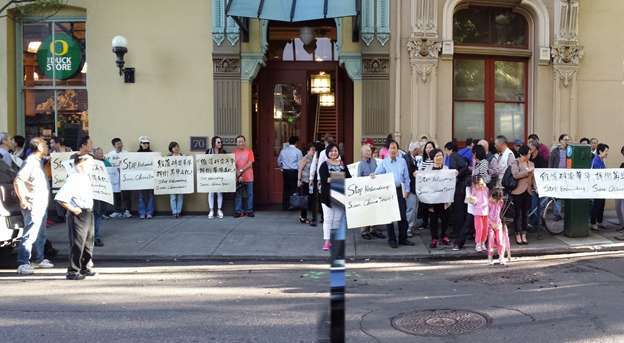 As the Chair of newly formed Oregon Chinese Coalition and a strong advocate for revitalizing Chinatown, I am writing to express my grave concern that the extension of the Housing State of Emergency declared by the City Council allows the council to waive zoning and other city regulations and policies and eventually paves the way to create the new 200-bed homeless shelter in Old Town/Chinatown. You probably remember I gave you my word in front of the roomful crowd at OTCTCA general meeting that you got my vote because your understanding about the history of Chinatown separated you out from other candidates and your pragmatic proposals about solving the issues facing Chinatown filled the gap Mayor Hales might have missed. I am also sure you did get the votes from majority of our Chinese community on the Election Day. 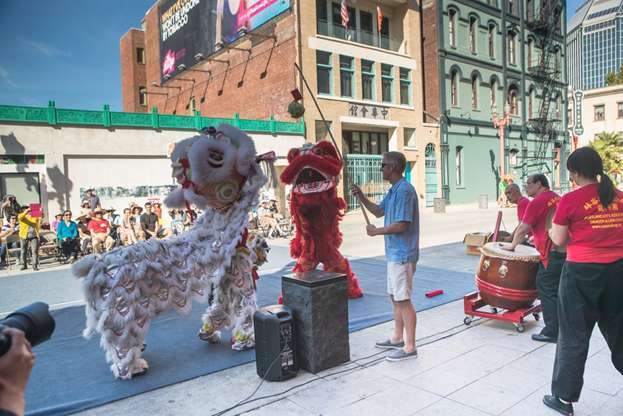 Our Chinese community always wants to help make Chinatown prosper again. We held a series of Saturday performances on NW Davies Festival Street in 2016. We were grateful to have you speak to the audience in one of the events. We wanted the lions to bring the energy and wisdom to you as the Mayor-elect. We certainly hoped such activities brought good luck and fortune to the business and residents in Chinatown. We realized the complexity of property ownership for most of Chinese owned buildings in Chinatown. We brought new blood and fresh ideas into Chinatown by working side by side with traditional Chinese organizations and those immigrants who came to the States over 100 years ago. As a showcase, we invited a group of 14 local Chinese who were engineers and professionals to form a buying group and were able to convince the owners of Wong Laundry building to pass the property to us. We wanted to demonstrate what we can do and accomplish for the buildings owned by the Chinese in Chinatown. Above is the concept drawing Emerick Architects did for the building and we expect the project to be completed in 2018. We are working with Prosper Portland (PDC) to get involved in the project on the vacant lot used to be R2D2 camp. 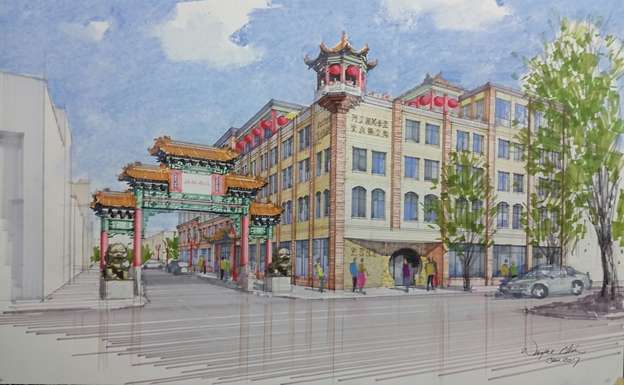 We have expressed to Prosper Portland that the corner lot would be the best place to enhance Chinese culture elements to Chinatown and the Chinese community will make Portland be proud of the new structure we will put up there with partnership from all the stakeholders in the community. The following is a concept drawing from a local Chinese artist. You might be aware that all Chinese organizations are not selling their properties in Chinatown anymore. We choose to stay in Chinatown and hold on to the heritage and culture from our ancestors. 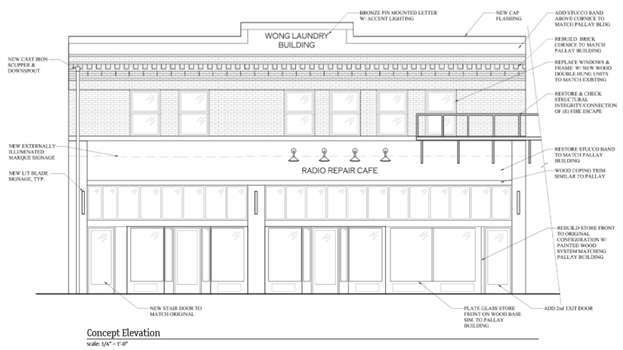 If Wong Laundry building marked our first step for the process of rebuilding Chinatown, the project on this corner lot will have an immense leverage over all the Chinese property owners in Chinatown. As a minority community, we Chinese tend to have a lot of sympathy to those groups who are also marginalized. Even though we know Oldtown/Chinatown has been burdened with the over concentration of the social services for years, we treated those sleeping on streets and receiving services as part of our big family members, with respect and dignity. 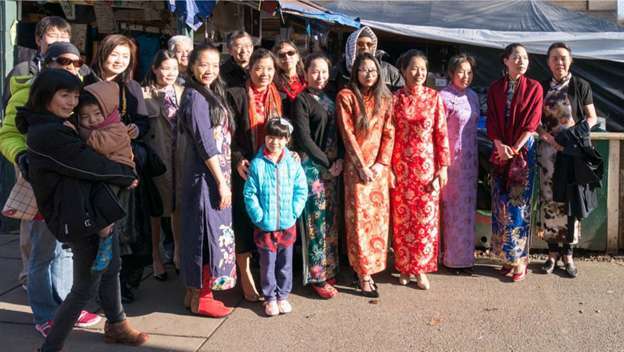 Before the Christmas of last year, we had a flash mob in Chinatown, with a solo violinist performing on upstairs of Bing Kong building and a dozen of beautiful Chinese ladies in Qipao delivering hot Chinese food to those homeless people in R2D2 camp. The Oregonian had a whole page report on this event, which brought up a lot of constructive discussions on their website. The smiling faces are badly needed in this part of town, which has been neglected intentionally or unintentionally for too long. It is not fair to anyone in the community and the City. It is time for us to do the right thing. The proposed 200 bed shelter in Oldtown/Chinatown will just do the opposite. You should have seen the indisputable response from the community against this proposal. Homeless issue is a social issue and needs to be addressed by the society as a whole, not disproportionally by one community. Existing social service infrastructure in the area should not be used as a reason for the convenience of adding more shelter beds. The City should consider relocating some of the social services away from Chinatown, giving a breathing room for the community to catch up with rest of the City. If Chinatown continues to be treated unfairly, those depressing properties will be forced to open doors to the night club businesses. Eventually City will pay a much bigger price for the consequence of their acts today. 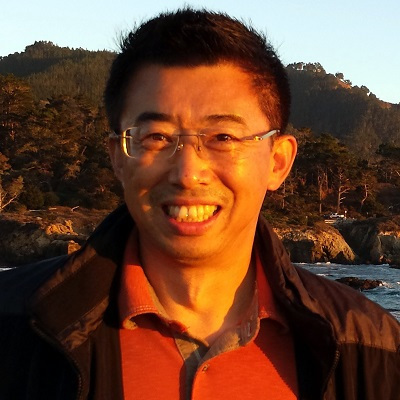 The newly formed Oregon Chinese Coalition has its vision of building a connected and united Chinese community that embraces diverse socioeconomic backgrounds, political beliefs, and religious and cultural traditions. Together, Chinese helped build most of the trans-continental railroads over a hundred years ago. For more than a century we contributed to this great country with hard work, talents, Chinese food, Chinatown, and much more… We are proud of being Chinese American. At the same time, we want to be treated fairly as an ethnic group. We want to hold our government and elected officials accountable for their policies and promise to the voters. The following photo was taken during the protest against OTCTCA’s rebranding attempt. We realized that it was not just a marketing tactic by dropping Chinatown from the name of the community. Any act to further delay Chinatown to recover from the slump in the last decade is not in the benefit of anyone, including those homeless people who need not only a bed but also a smile on the faces of their own and all the people around. My daughter, Alisha Zhao, will fly back from college next month to receive the Spirit of Portland award as the outstanding youth leader from your hand. Her nonprofit organization, Kids First Project, has helped hundreds of Portland homeless families, in particular, their children. The caring tradition is the most important part in Chinese culture. We give and do not expect anything in return except a respect, a basic need for any human being including those homeless people who happen to be in the spot light today. Thank you for your consideration. I am sure there are many ways to address housing crisis for homeless. All we ask is to look beyond Chinatown.